Staging collapses in Belgium today. Outdoor concerts are being scrutinized in the wake of Saturday’s (8/13) tragedy at the Indiana State Fair, where strong winds caused the staging to collapse, killing five people and injuring more than 40 others. 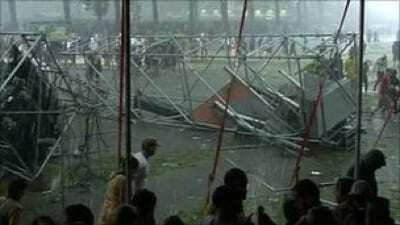 Today (8/19) comes the unsettling news of a disaster at a music event in Belgium, where at least two are confirmed dead after a storm hit the Pukkelpop festival. According to music site Spinner.com, this is the fourth stage collapse of the summer. It joins the dangerous list that already includes the Indiana fair, an incident during Cheap Trick at the Ottawa Bluesfest, and the Flaming Lips’ outdoor show in Oklahoma. An Associated Press article gives some insight into the dangers of outdoor events. It includes a discussion with promoter and ACM head Bob Romeo, and notes that part of the problem is a lack of uniform safety regulations.